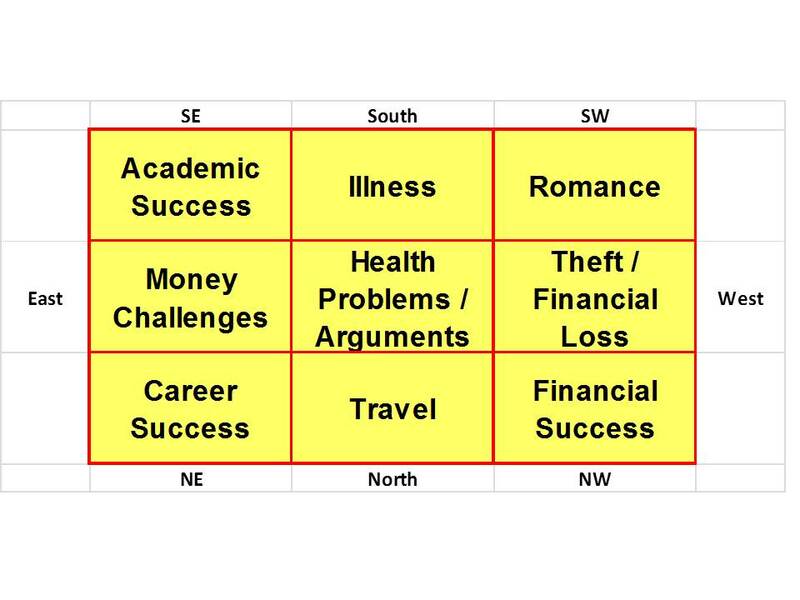 Southeast – This direction can bring money and health obstacles. If you’re interested in getting a loan for a new car, home or other item the banks may not be as receptive to your request this month. South – If you’ve been looking for a job, new clients or trying to increase sales to existing clients spend time in the south this month. This area is great for job hunters, sales people and entrepreneurs especially if you’re a woman. Southwest – Arguments between mothers and sons and/or women and men in your place of business are more likely to occur in the SW area of your building this month. 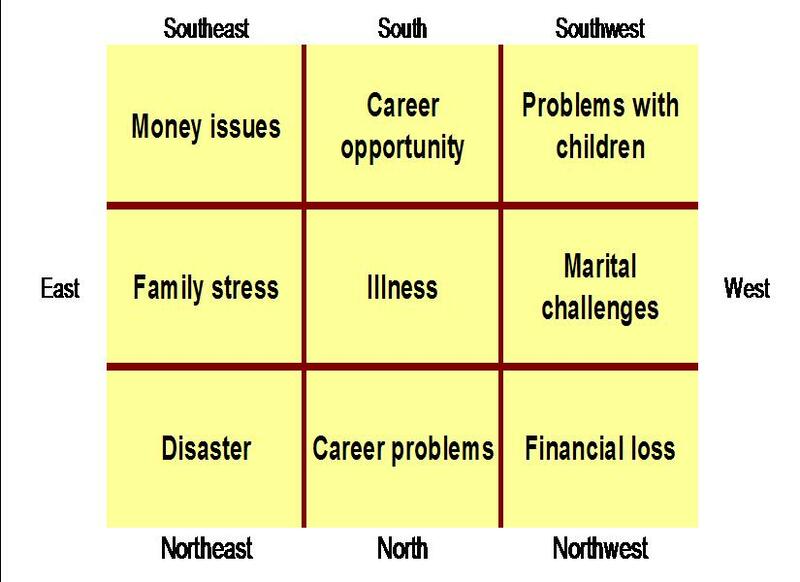 Center – While the south is good for career the Stars in the Center gua are not. Try to avoid this area if possible. East – The Flying Stars in the east can bring moodiness and cranky people – mainly other family members. This is another area that reminds us to keep a sense of humor this month which is not always easy to do with your own family. North – This area is good for travel but can create health problems especially around water. If you go swimming or go on a trip where sanitary conditions aren’t the best make sure the water is clean before you swim in or drink it. Northwest – This area is prone to arguments between men so if there are any men you work with or live with who don’t generally get along keep them out of the NW area of the building/home if you can. Southeast – This is a great area to spend time in if you’re a writer or a student. The Stars sitting here are ideal for success in both of these areas this month. South – The Double Illness Star is here for the month and sits with Grand Duke Jupiter, which is a yearly energy. This is a bad combination. Avoid sleeping or spending more than 2-3 hours in rooms that are in the south area of your home this month as this area is prone to creating illness. Southwest – This is an area that is ideal for romance and creative endeavors. If you’re married it can create arguments between wives and mother-in-laws. West – The Double Robbery Star is here which is not good for finances. This area is prone to theft and financial loss this month. East – This area is prone to arguments, disagreements and other conflict. Expect to hear more news about additional fighting in the Middle East this month. North – This area is good for travel but you may disagree about where you want to go. Northwest – This area is ideal for just about everything: money, career, getting help you need, friendships and more. Spend lots of time here this month! It’s been so long since I’ve blogged on WordPress that the whole format of the site has changed! It took me a second to confirm I was in the right place. Anyway, a number of people have e-mailed me to ask when the Flying Star outlooks would be posted again so here is October, even though it’s a bit late. Every direction this month has double energy because all of the Flying Stars are doubled up. This means the beneficial areas are twice as good and the not-so-great aread are even less great. Keep in mind that this outlook is best used from a global perspective so if you pay attention to the news you’ll see these Stars playing out their predictions on a worldwide and country level basis. For individual predictions you really need to look at your personal best directions and what they mean for you in order to determine how and if they are likely to have any impact. 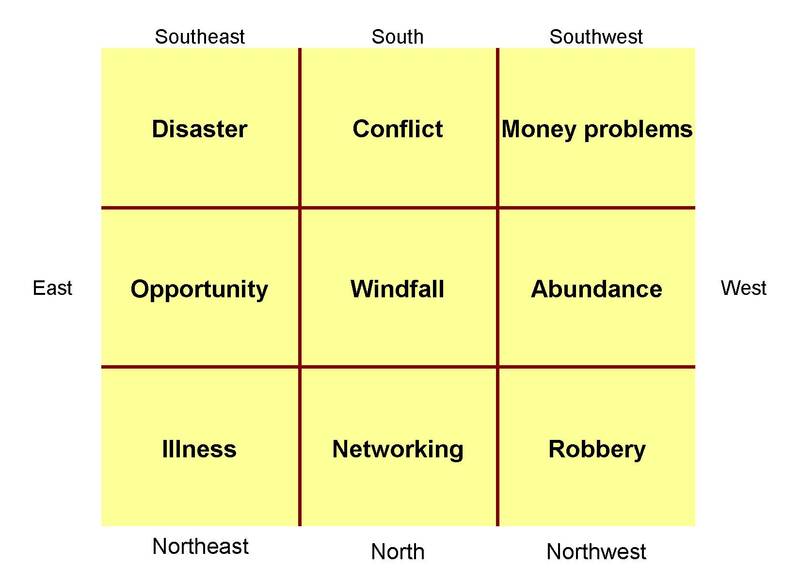 Southeast – The Disaster/Transformation Star sits here and its sitting in the area of wealth and banking. This indicates trouble for banks, the stock market, investment firms and other areas of finance. It can also bring about events that lead to change in the future for these areas. South – New opportunities and new beginnings are likely in the areas of fashion, entertainment and also for middle aged women. If any of these areas apply to you now is a good time to launch a new endeavor or new idea. Southwest – This is the area of partnerships, motherhood and marriage. The double Conflict Star indicates an increase in disagreements and arguments between business partners, mothers and children and couples. Keep your sense of humor and be sure to share funny stories and watch funny movies. Don’t discuss politics or religion unless you know the other person shares your views. East – This area is great for strengthening relationships with family members, family reunions and getting help from the government for any issues you may need to take care of right now. Center – The double Windfall Star sits here meaning opportunities from out of the blue or even bonuses, financial gains or other unexpected positive events could unfold for you this month. This Star can work for your benefit regardless of your best directions. West – This area is for wisdom and learning right now. It’s great for school children and for people who are doing research, particularly in the area of technology or those who are inventors. It’s a good month to buy technology related products. Northeast – The double Fame Star puts the spotlight on education and religion. This could be positive or negative, meaning that there could be positive news about these areas or negative news about these areas. Religious tension could be very high this month all around the world. North – Not a great month for businesses because the Illness Star sits here and is twice as strong as it’s been all year. This is particularly true for businesses that have a front door facing north and those businesses in the water, shipping, cruise line, diving, and beverage industries. 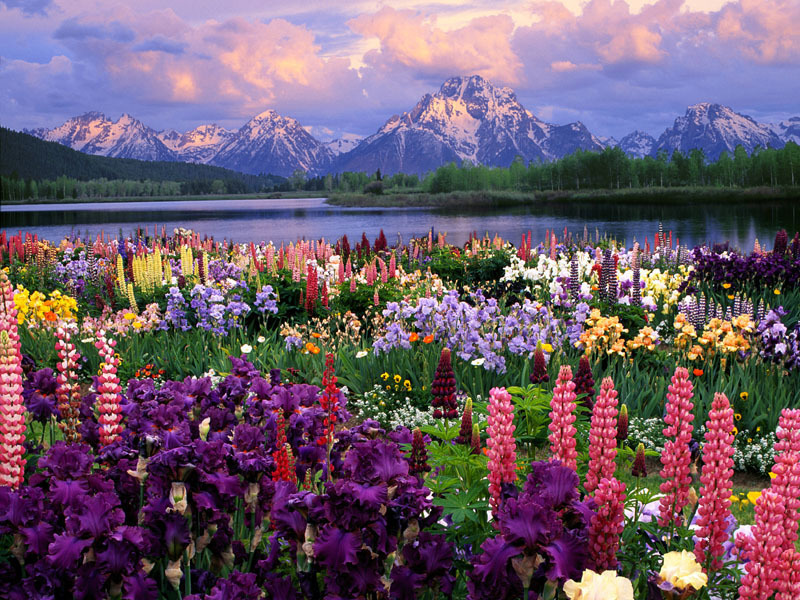 Northwest – This is the direction for travel, mentoring, clients, and outer space. The double Robbery/Violence Star is here indicating a loss of money and/or injury in one or more of these areas. This could mean that the cost of air travel goes up, more travel related accidents occur, people decide to spend money for advice, etc. That’s it for October. Enjoy! Southeast – This area is experiencing double negative energy this month as the Robbery/Violence Star meets the Disaster Star. The southeast is the area of money, wealth and banking which indicates more bad news about banks, financial firms and the stock and bond markets not to mention the economies around the world. On an individual level your more prone to things like losing your wallet, accidentally leaving your wallet or purse somewhere or having money taken from you in a less than pleasant way. South – Conflicts could arise at work with the Stars that sit here in August. This is particularly true for middle aged women and people in the fashion or entertainment industry. Expect more news about celebrity breakups or even seeing high profile people disagreeing publicly. Southwest – This is another tough direction and brings conflicts over money to marriages, partnerships and other close partnership-type relationships. If you’re in business with someone you may find that money is tight this month or that you disagree on how to spend money you have in your business account. If you’re married or have a live-in roommate or significant other you share expenses with you may find someone isn’t holding up their end of the bill sharing which will definitely bring conflict this month. East – This direction is one of the bright spots of the month. If you’ve been hoping to get a financial bonus or have a door of opportunity open up for you this month it could happen. Center – This direction is good for windfalls, too. Alternatively, you could unexpectedly receive money you invested or loaned some time ago. West – The west is a good area for general abundance and good fortune so spend as much time in the west area of your home this month as you can. Northeast – The double Illness Star sits in the NE for the month so if you are prone to illness or have a chronic illness avoid this area if you can. Even if you are a healthy person the effects of the double Illness Star can affect you by leaving you feeling run down and tired mentally, emotionally and/or physically. The double Illness Star can also mean that schools may have to cut their budgets due to unexpected loss of revenue. North – The Relationship Star flies into the north which is good for making connections with people through your work. Northwest – The double Robbery/Violence Star sits in the area of helpful people and travel. This energy can bring about more travel related accidents and even increases the chances of terrorist type activities around the world. If you’re traveling at all this month the trip may well cost you more than you anticipated so bring extra cash. Today there is a solar eclipse beginning at approximately 8 p.m. EDT. 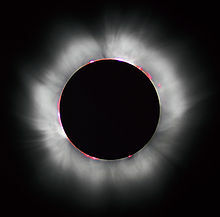 Solar eclipses bring new opportunities and change to the area of your astrology chart that is being eclipsed. I don’t practice astrology but on a map of the world the eclipse will travel from the east gua to the NW gua which could mean that the areas where we see the greatest changes around the world will include family businesses, the family as a unit, government, travel, space, astronomy/astrology, health, prominent leaders (think Heads of State) and even history. This is a great day to re-energize crystals you have in your home or office. Just put them in a bowl of water with sea salt for about 15 minutes, rinse them off and then put them in the sun for the day. Solar eclipses are ideally suited for super-charging your crystals so take advantage. The next opportunity won’t come until Nov. 13, 2012. And since this day is packed with extra energy it’s also a great day to write down and meditate on any goals you have for your health, relationships, career, finances, living situation, etc. Last but not least, if you would like to participate in the May 23-June 21 ’27 Days to Inner Peace’ program today is the last day to sign up. Although I have not listed this on the web page, as a result of the feedback from a number of surveys I received my focus is going to be two-fold: peace and prosperity. I can’t wait to see how it turns out! “I don’t quite know where to begin. This has been phenomenal and I am SO grateful, so very grateful for what you have done for & given to me.When I started this the Inner Peace Program I was in one of the darkest times in my life. I’m 54 years old, and I’ve had some dark times, but this was pretty intense, and was feeling hopeless. My mom passed away 1 1/2 years ago and I’ve spiraled downwards since then even though I was trying very hard not to. Life felt…..dark, full of despair and I was very lost, very negative and I am usually a very UP person and can see the positive in all situations. I had lost that. As the program started everything unlike love was bubbling up & out!! However, the funny thing is as this was happening I actually started to “turn around” and lighten up IMMENSELY. The darkness and despair are GONE. I am looking forward to the rest of my life and I’m even having moments of joy which I have not had in a VERY long time. My relationships have become easy and I’m getting calls for work of all sorts so my finances are blossoming and I’m feeling a purpose in my life again.And….this is HUGE……..I don’t feel mad at God anymore. I feel more accepting of my life and others, I’m having more tolerance and quite frankly, I find myself laughing about life now. I could go on and on Chriss. I am in a place that is completely 180 degrees from where I was when we started this and THAT IS A VERY GOOD THING. I plan on signing up for the next round of 27 days, whenever you are ready to do it again. I want to keep this going and I hope ultimately to share it with others as time goes on. To me, it seems Chriss, like “Thank You” doesn’t even begin to touch on the depth of gratitude I have for this program. I’m ready to go on and live life again. And your list probably goes on from here, right? Lots of us turn to feng shui to help us create a soothing home environment so that at the end of the day we can come home and relax. But if your outer world is still making demands on you when you get home from work how are you supposed to unwind? Certainly you could go to yoga or do meditation before coming home to center yourself. But do you have an extra hour to do that after work and still get home in time to do everything else that needs to be done? Most people don’t and you probably don’t either. On the surface, it would seem that the feng shui isn’t working the way it’s supposed to. The truth is that feng shui is only part of the key to having tranquility in your life. It’s the environmental piece and it’s important. The other important piece is how you feel inside — or your inner feng shui if you will. When your environment is calm and supportive and you feel peaceful and centered inside you’ll see that it really doesn’t matter what else is going on outside of you … because you can handle it with ease and grace. If you’re ready for lasting tranquility then it’s time to allow inner feng shui into your life. Click here to find out how to get it without having to do any work on your part. It’s true, just ask Sheryl. May 5 begins the new Flying Star month! Because feng shui works in cycles of 9 you could find that you feel the effects of the Flying Star changes as early as 9 days before the new month begins. This is why putting your Flying Star activations in place can be beneficial even before the Stars moving into their new directions each month. Southeast – If you’ve been interested in a financial makeover this is a good month to get one. The trick is that you will want to make sure that you or the person you’re hiring knows what they’re doing. Otherwise, things may not turn out too well for you. South – A windfall that comes through your career is more likely this month, especially if you’re a woman, in the entertainment business or work with people who are famous in their industry (even if they’re not famous to the general person on the street). This windfall could come in the form of a bonus or promotion and would be a one time event. If you see an opportunity you want, now is the time to go after it. This is one of the directions you will definitely want to activate right now or even before May 5 because this Star combination doesn’t come along often. Get your Flying Star activations by clicking here. Southwest – This area can be challenging for mother/son relationships. Keeping your sense of humor and listening will help greatly this month. East – Family members may leave you feeling burned out, tired or emotionally/mentally drained this month. They are also more likely to look to your for advice (or you to them). Center – It’s going to be easier to catch colds, the flu or be diagnosed with an illness unexpectedly now. If you’ve been feeling under the weather it’s a good month to get a check up. West – This area can be stressful for marriages but it’s a good month to work out problems with your partner because the results will be long lasting. 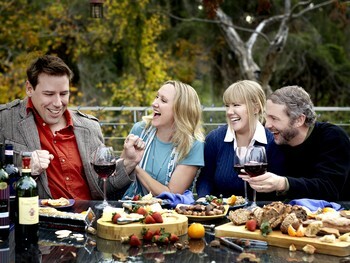 Now is a good time to make new friends and socialize through fun activities. Northwest – Disagreements and lawsuits will increase, especially among world leaders and groups like the U.N., World Bank, IMF and other large, global institutions. Violence will escalate, too. North – Jobs are likely to be lost this month and the jobs report will be dismal (again). Businesses are more likely to see revenues drop, especially those companies that are in industries like cruise line travel, beverage distribution and production and water related activities like shipping. Northeast – A double Disaster/Transformation Star sits on religion and education now so the leg work you’ve been doing or issue you’ve had with regard to learning and/or religion will come to a head now. This can mean a graduation, changing of schools or religious affiliations, finishing that final term paper, quitting school/religion or even signing up for school or beginning a new religious or spiritual practice. Because the NE is also the area related to big earth we could see an increase in volcanic activity or other earth related disaster. For some reason an image of a mountain trekking event gone bad comes to mind.